1. Reliability: fewer moving parts than propeller drive systems with most major components inboard and out of harm's way. Waterjet systems are a good fit for BC waters that host a large and mobile population of semi-submerged logs. 2. Maneuverability: waterjet propulsion allows for superior steering when compared with propeller/rudder systems, especially at slower speeds. With Hamilton jet, you can even turn your boat while it's stationary. The water jet turns your boat via deflectors that control the direction of water flow similar to thrust vectoring nozzles installed on a modern fighter jet. 3. 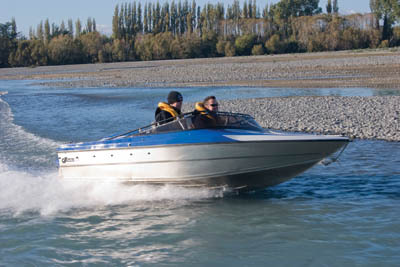 Shallow water access: boats equipped with Hamilton Jet are better suited to navigate through shallow water areas. Rotating propellers are easily damaged from striking objects on the ocean, lake or river floor. The rotating components of a water jet system are fully enclosed inside the boat's hull. 4. Safe swimming: have you ever felt a little nervous about swimming near a boat propeller? With a waterjet installation there's no spinning parts on the outside of the boat allowing a more relaxing dip for the swimmer and the boat operator. 5. Braking: water jet systems can allow your boat to brake to an emergency stop within a distance as short as the length of your boat. 6. Efficiency: boats propelled by HamiltonJet systems are more efficient in the 20--50 knot range (up to 90 km/h; 60 mph) due to the absence of drag producing appendages such as struts, rudders, shafts, drives etc. 7. 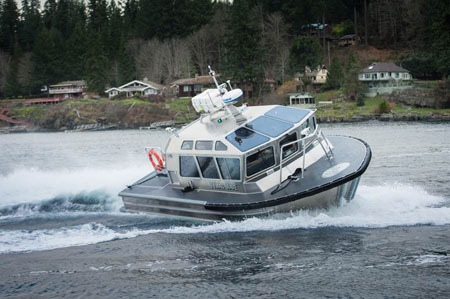 Innovative Control for Commercial Applications: HamiltonJet engineers are introducing new control and waterjet systems that allow commercial work boat operators in surveying, fishing, tug and other applications to substantially improve how they handle a vessel. 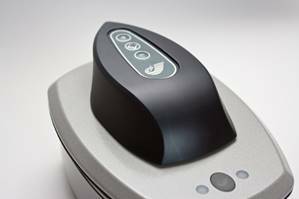 The JETanchor positioning system (with a Mouseboat one-handed control) is an addition to HamiltonJet's blue ARROW control features. JETanchor includes a 'Station Keeping' mode to allow the operator to automatically hold vessel position and heading more accurately than is possible using manual control. 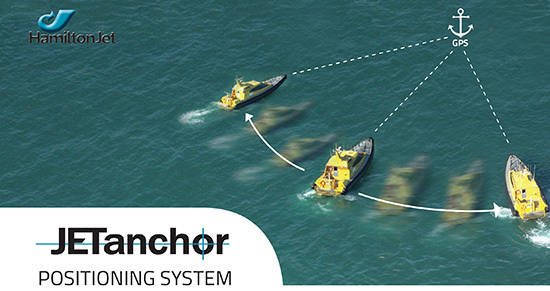 'Virtual Anchor' mode allows the system to set a single GPS point 'swing' mooring for hands-free standby operations keeping the vessel in a comfortable position. 8. 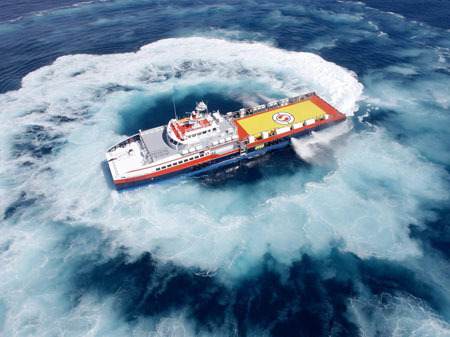 Economical: it's typically less expensive to run and maintain a HamiltonJet over the lifetime of the jet than a stern drive, conventional propeller and shaft, IPS, surface piercing or thruster drives. 9. Parts Availability: HamiltonJet is known for its next day parts delivery and access to worldwide emergency parts within 3 days. 10. Fun, fun ... and more fun! 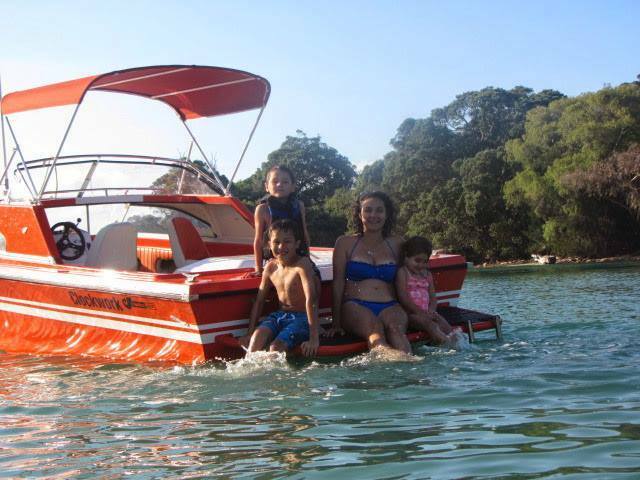 Try piloting a jet boat and tell us you don't love it!